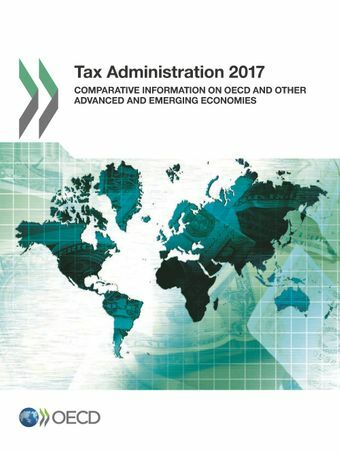 This report is the seventh edition of the OECD's Tax Administration Comparative Information Series. It provides internationally comparative data on important aspects of tax systems and their administration in 55 advanced and emerging economies. The format and approach for the 2017 edition of the publication has been revised. The commentary is now more succinct, focusing on significant tax administration issues and trends. It provides increased analysis, backed by more than 170 data tables and complemented by more than one-hundred examples of innovation and practice in tax administrations. It also features eight articles authored by officials working in participating tax administrations that provide an “inside view” on a range of topical issues tax administrations are managing. The report has three parts. The first contains seven chapters that examine and comment on tax administration performance and trends up to the end of the 2015 fiscal year. The second part presents the eight tax administration authored articles, while part three of the publication contains all the data tables which form the basis of the analysis in this report as well as details of the administrations that participated in this publication. This is the first edition of the Tax Administration Series where the data has been collected through a joint web-based survey – the International Survey on Revenue Administration (ISORA) – developed in co-operation between the OECD, the Inter-American Center of Tax Administration (CIAT), the Intra-European Organisation of Tax Administrations (IOTA), and the International Monetary Fund (IMF). This single international survey is an important development which will simplify the collection of data and will improve international comparability across a broader range of countries. At the request of survey participants the four organisations that developed ISORA have gone to considerable effort to agree and document a range of words and terms used in the survey and their meaning. This has allowed a significant reduction in the number and use of footnotes in the publication compared to the 2015 edition. While this has improved data integrity and comparability between administrations, care is needed in making comparisons with prior year information as definitions may now exist for terms not previously defined, or in some instances, have changed. This may mean that a small amount of data and ratios reported in previous editions can no longer reliably be used. The data contained in Annex A of the report can be accessed via the StatLinks provided underneath each table or via the Tax Administration 2017 Data Portal. The OECD's Tax Administration Comparative Information Series, which commenced in 2004, examines the fundamental elements of modern tax administration systems and uses an extensive data set, analysis and examples to highlight key trends, recent innovations and examples of good practice. The primary purpose of the series is to share information that will facilitate dialogue among tax officials and other stakeholders on important tax administration issues, including on identifying opportunities to improve the design and administration of their systems both individually and collectively.